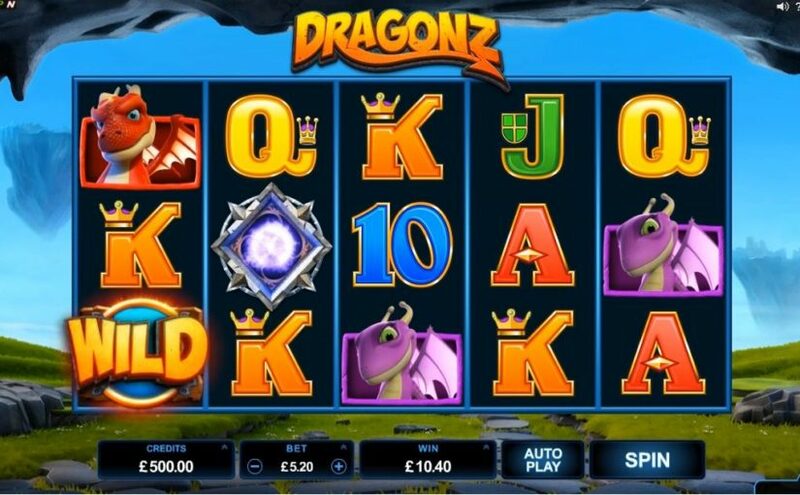 Dragonz online slot is a 5 reel, 243 ways to win slot that has amazing 3D animations and is powered by Microgaming. Dragonz brings an unmatched cinematic quality to gameplay as the awesome foursome explore new landscapes in search of treasure. Along with traditional features like scatters, multipliers, bonuses and expanding wilds, this 243 ways to win game is bursting with originality. There are 4 different free spins rounds. Flint sets the reels alight with an increasing number of Flaming Wilds for each spin. Frost freezes non-winning wilds until they crystallise into wins, keeping free spins spinning until all Frosty Wilds have been iced. Gobble turns symbol positions wild with his gooey green slime, creating Winning Wilds that stick fast during the feature. And sparks fly when Switch taps into the electric power of Stashed Wilds, awarding wins with a flash of lightning after three or more wilds have been stashed. Once the player has triggered the free spins bonus 12 times, they unlock the player choice reward where they can elect which free spins feature to play. But Dragonz isn’t just about free spins. The original Wild Deal, activated after a non-winning wild lands on the third reel, randomly distributes extra wilds onto the reels to award a guaranteed fabulous win!